I have 2 Green Cheeks, an almost 2 year old male named Hawaii and an almost 1 year old female named Sophia. My birds are wonderful and basically my children, but raising birds is not for the faint of heart. I allow my birds to live flighted, cage free except bed time in my home. This in my opinion is truly what's best for them both physically and emotionally. It's not necessarily the cleanest and easiest way to live however. If you want a pretty object in a cage, get a plant. Feeding can also be a bit of a pain. Birds need a well balanced pellet available at all times as well as fruits and vegetables. There are some exceptions, as avacado, onion, and garlic are toxic. Birds should always have fresh water both for drinking and bathing. As far as behavior, Green Cheek Conures are known to be nippy, and with my male Hawaii I have found this to be true. He is from a large chain pet store and from what I've read online and experienced, this is not the way to go. Sophia his mate is from a breeder and much more calm and friendly. 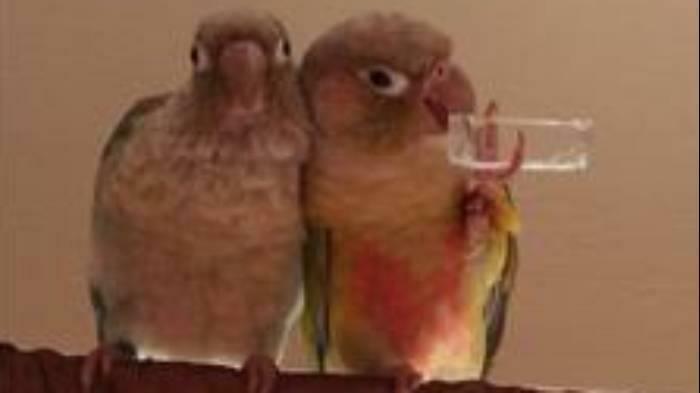 Both of my birds talk, although they can be shy in front of people other than me and my husband. Green Cheeks aren't known to be great talkers, but Hawaii makes up for biting with his vocal abilities so you may get lucky. He can say several phrases. Sophia doesn't talk all that much, but she is sweet mannered and gives kisses. I love my birds and there is a chance that they are for you also, if you can commit to at least 3 hours of out of the cage time a day, training, and feeding your bird. They are so smart, I'm continually amazed by them especially for such a small bird. I would suggest though if you are getting a Green Cheek to purchase from a breeder if it is your first bird, for less challenges.